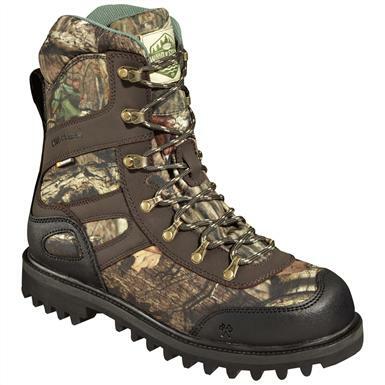 WATERPROOF breathable 8" Wood 'N' StreamTM Camo Interceptor Boots. Indifferent to the many moods of Mother Nature. And prepared to do whatever it takes to track your once-in-a-lifetime trophy. Built with X-Stream Waterproof Technology, shock-absorbing comfort and an ultra flexible outsole... all for a price that's right on budget. Mossy Oak Break-Up® InfinityTM. 28 ozs. each.